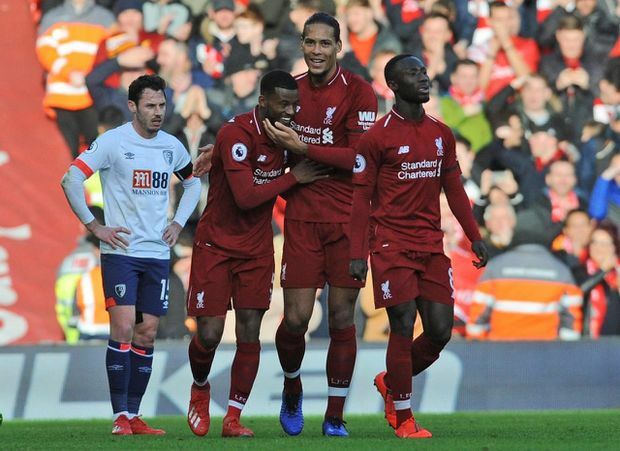 Liverpool's Georginio Wijnaldum, center left, celebrates with Liverpool's Virgil van Dijk, center right. Saturday’s win was convincing indeed. After being held to two straight 1-1 draws, Liverpool rediscovered its attacking verve as goals from Sadio Mane and Georginio Wijnaldum essentially decided the game after just 34 minutes, and Mohamed Salah added the third in the 48th. If not for a number of missed chances in the second half, the scoreline easily could have been doubled. United climbed above Chelsea into fourth with a 3-0 win at Fulham, while Arsenal was level on points with Maurizio Sarri’s side after beating last-placed Huddersfield 2-1. Sala’s body was recovered on Wednesday from the crashed plane that was taking him to Cardiff, after he signed for the Welsh club from Nantes in January.